Access routes to the Center by car. Granada has some traffic restrictions for individual transport (by car). In the following map you can see different recommended itineraries to get to the city center for visitors who arrive in their cars from A-44 (Motorway Bailen - Motril). In traffic and mobility terms, we consider the center of Granada the area between Méndez Núñez - Severo Ochoa axis, Camino de Ronda, River Genil and the Alhambra and Albaicín hills. Granada city center has an special protection with prívate traffic because of its characteristics: limited parking places, and also streets width that conform it, because it is an historic centre has a few capacity roads. In the city center we find the main public transport line: 4 (Constitución avenue - Gran Vía - Reyes Católicos - Acera del Darro), that has an special consideration to improve public transport. The best suggestion is to park your car out the restricted area and use public transport to get your destination. 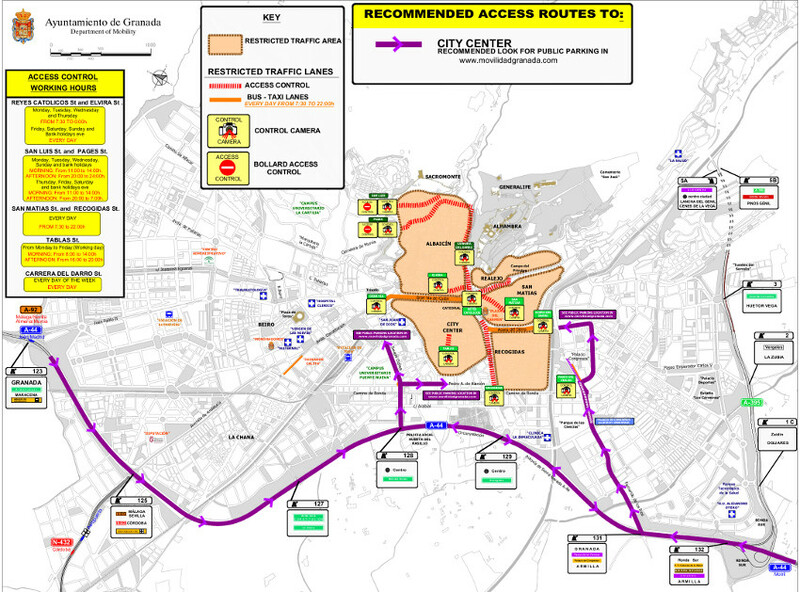 You can reach easily city centre by line 4 buses. You can get line 4 at PTS and Dilar avenue in southside or at Chana/Villarejo in North of the city.